Carl Frampton aims to seal his status as an Irish boxing legend by beating IBF world featherweight champion Josh Warrington at the Manchester Arena later this month. Two-weight world champion Frampton wants to leave a similar legacy to that of ex-manager Barry McGuigan and believes victory in the so-called ‘Battle of Britiain’ on December 22 - and a fourth global title - would suffice. “Of course it would,” the 31-year-old said. “I’ve done pretty well in my career so far. I’ve won some big titles and unified a division and won a (world) title in a second division. McGuigan won the hearts of communities both sides of the Irish border when he became world featherweight champion in London in 1985. The Clones Cyclone wore an image of the dove of peace on his shorts and helped unite a divided Ireland during his heyday in the ring. Frampton enjoys similar appeal, but Leeds champion Warrington was roared to victory by a partisan Elland Road crowd when deposing Lee Selby of his crown in January. Warrington is widely regarded as a bigger ticket seller, while Belfast’s Frampton claims the neutral venue, where he defeated Scott Quigg in 2016 to retain his IBF crown and win the WBA version, will feel like home-from-home. 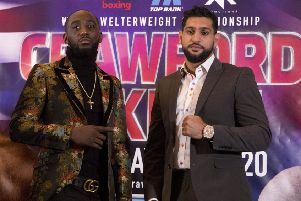 “I train in Manchester now as well and I won’t say it’s going be like a fight in Belfast, but it will not necessarily be like an away fight and I’m used to the arena,” he said. “The thing is with Leeds in particular, if you’re not from Leeds you won’t support a Leeds fan. Warrington, 28, is renowned for his ardent following, but tends to agree with Frampton’s assertion. “Yes and no,” Warrington said. “Since I beat Lee Selby I’ve won a lot of fans over. A lot have bought in to the way I won. “Obviously the Leeds fans are massive, but that being said not many people like Leeds United and I obviously associate myself with Leeds United. Warrington insists he still has plenty to prove after upsetting the odds to dethrone Selby. “It feels like that,” he added. “I beat Selby and was still ranked number two in the British rankings behind Carl, which is funny because I’m world champion in the division.